I’ve been in the OTA (Online Travel Agent) business for over 20 years, most recently with Agoda where I was the Country Director of Agoda Malaysia and Brunei. In my time with them, I also oversaw operations in Jakarta and Indonesia, as well as serving as a senior advisor to Agoda Japan. 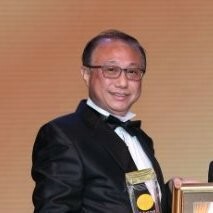 Prior to that, I spearheaded the Asia Web direct business in Malaysia. Blockchain is very much new to me and I am a self-confessed rookie! However, I’m fascinated by the technology and the potential it has, and I’m learning fast! We’ve assembled a great team, embracing a culture of sharing new ideas and opinions, and it feels like every day they teach me something new. In return, I share my experience and knowledge of OTAs and the travel sector, and we all grow and develop together. I was approached by the founders, and after they shared their vision with me I knew it was something I wanted to be involved with. The online booking sector is ripe for disruption, and the GOeureka team’s plan to launch a commission-free booking platform struck me as a great approach. I could see it would be a perfect fit for me, allowing me to share my knowledge and understanding of the hotel business from the eyes of an OTA, and help to shape and guide the building of the GOeureka platform. I believe blockchain technology will be another milestone for online hotel bookings, which have depended on OTAs for many years, and the opportunity to be involved in bringing this new evolution to the industry is very exciting! I provide insight and feedback on the online travel sector and show the team how we can best bring hotels on board the GOeureka platform. Signups will be critical for the platform’s success, and I’m pleased to say we’re seeing a lot of hoteliers eager to embrace the change. We already have over 200,000 hotels keen to participate and we’re pursuing new partnerships every day! It’s tough to choose! I think providing commission-free bookings to hotels will be a real game-changer, providing a better experience and added value for hoteliers and travellers alike. However, I’m also looking forward to seeing users paying for their online bookings in cryptocurrency. The ability to transact in crypto is really new and innovative, and I think as more and more people come around to crypto and the blockchain space we’ll start to see that feature having more and more of an impact. I see the price war between the major OTAs continuing to heavily impact the sector, creating a challenge for both OTAs and hotels as to how they can best manage their rates. Ultimately I think our approach, a commission-free booking solution, will grow and gain traction. Metasearch engines will become more popular, consumers will see more affordable room rates, and hoteliers will still get a better return and be able to channel more resources back into their business. How do you feel about GOeureka’s progress to date? Development has advanced to the point where we now have a working booking platform, with the trial phase rapidly approaching in which we’ll be making our first test bookings. We’ve brought on board over 200,000 hotels, signed up and ready to participate when the GOeureka platform goes live. We’ve also seen our community grow and come together, with our initial coin offering (ICO) now in progress and our bounty campaign underway. GOeureka continues to go from strength to strength, hitting milestones along the way, and I’m looking forward to those still to come!